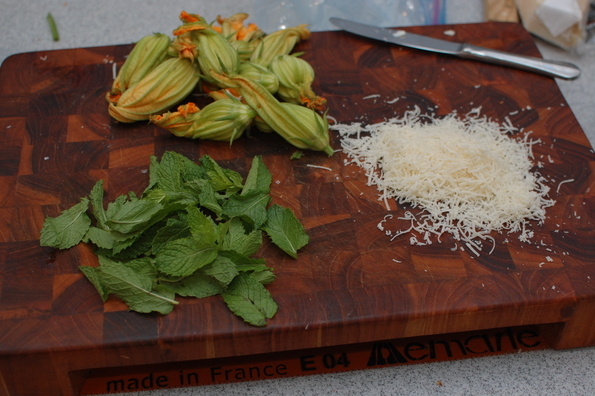 Squash Blossoms - You're Making a Mess!You're Making a Mess! I used to work with a guy that grew up in Italy. Like me, he loved to cook. I asked him one day — “Alessandro, what’s your favorite thing to make?”, thinking I’d get a pasta dish or a great pizza recipe. 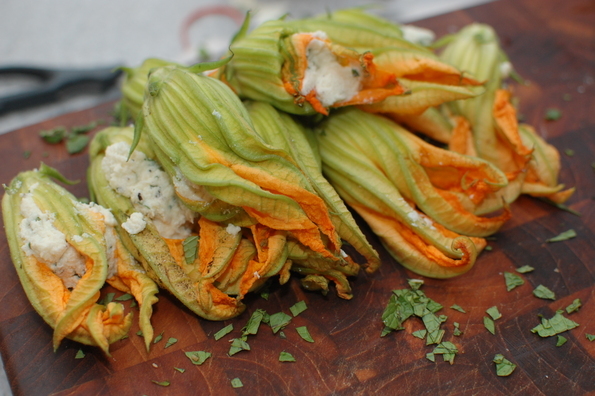 As it happens, a few weeks later I was in a farmers’ market and saw a nice looking bundle of squash blossoms. Without overthinking it, or finding a recipe, or planning anything out, I grabbed them. 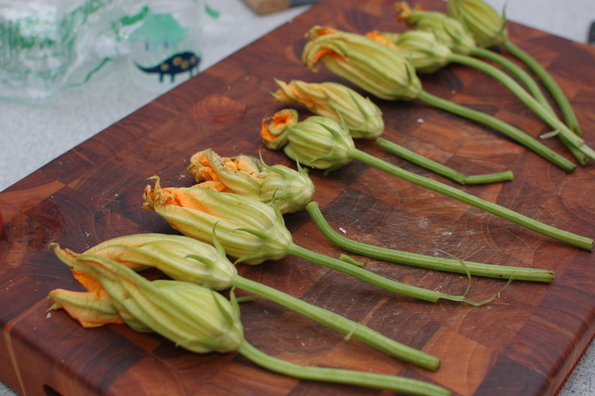 The difficulty with squash blossoms is that you have to use them immediately. Like, same day. We had other dinner plans that night, but this opportunity was too good to pass up — I had never cooked these before myself, and I don’t think I’ve even eaten them in a restaurant. A quick search found a simple recipe of mint, parmesan, egg. Whisk the filling together, and pack it into a ziplock bag. Cut the corner off, and pipe it into the blossom. Then, whisk together some flour and some very cold club soda. 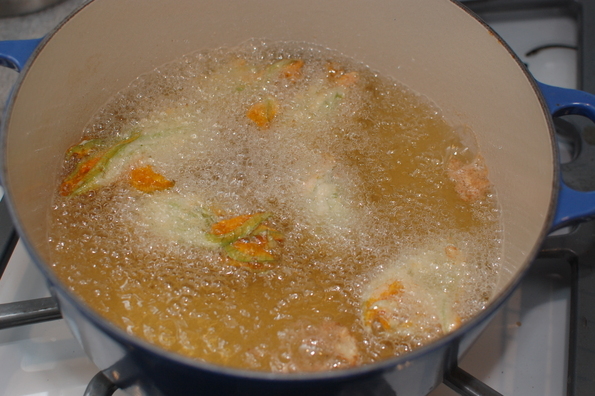 Give each blossom a quick dip, and then fry in a heavy cast iron pan with 375 degree oil until you get a nice golden brown color. 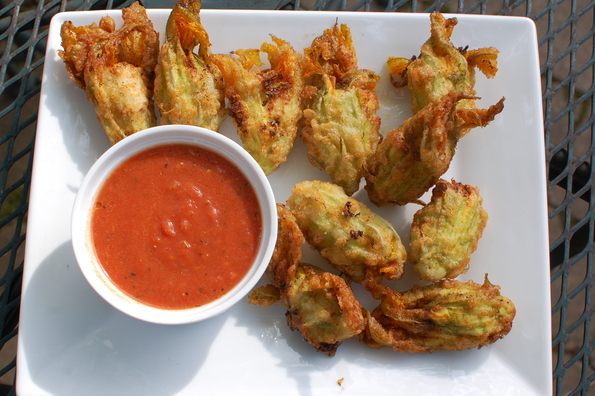 Dip them into some warm tomato sauce immediately after frying — if you’re not close to burning your mouth, you’re waiting too long. These are best right out of the oil. (Ok, but don’t actually burn yourself). What really works here is the delicate tips of the flower grab a nice coating of the batter and get super crispy. The creamy minty savory filling works perfectly with the crunch and sauce to deliver an addictive appetizer.